Whole-food based: Most vitamins and minerals have been derived from fruits, vegetables and herbs. Certified Organic: The ingredients do not include traces of pesticides or fertilizers. GMO-Free: None of the ingredients have been genetically modified. Missing some key nutrients: You may need to buy additional products in order to to obtain the necessary Omega-3 fatty acids and Calcium, which are critical during pregnancy. Price too low: Extraction of vitamins from organic plants is very expensive. There is no explanation as to how the company is able to offer this supplement for a fraction of the cost of the actual fruits and vegetables it is derived from. This raises the question - are the ingredients really derived from actual fruits and vegetables? Or are they simply created via fermantation of synthetic vitamins? Not 100% organic: The product includes some non-organic nutrients, such as lichen and natto, but it is understandable as certified organic versions of these plants are not widely available. 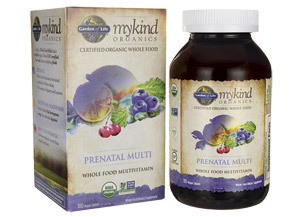 Based on our analysis, we believe that currently this is one of the best prenatal multivitamins on the market. Our only additional advice is to supplement this product with extra Omega-3 and Calcium supplements in order to obtain all critical nutrients your baby needs. How does Garden of Life mykind Organics compare with other multivitamin brands? MultivitaminGuide.org offers comparison between the Garden of Life mykind Organics multivitamins and of all major vitamin supplements available on the market. Some of the unique aspects of this guide include comparison of the Garden of Life mykind Organics Multivitamin with 100 other vitamin supplement products, including popular brands such as One-A-Day, GNC, Equate, Kirkland, Shaklee, Nature Made, NOW Foods, Melaleuca, Puritan’s Pride, Herbalife, TwinLab, and Walgreens. The table below provides a summary of the Effectiveness Scores of some of the more popular vitamin supplement brands available on the market.